Today, movies provide entertainment to people all over the world. The movie industry has grown into a large revenue generating industry with the top movies generating over a billion dollars in ticket sales. The release of new movies and the enormous sales generated from their success like that of Black Panther, which generated over $1 billion in sales just 28 days after the release, have sparked our interest in what attributes have been associated with highly successful movie releases both in the US and around the world. Finding datasets for our project was fairly difficult considering a lot of movie studios keep information regarding generated sales internal. Another reason why it was difficult was because movie data changes by hour so we wanted to make sure that we found a source that would update frequently for more accurate results. We decided to use BoxOfficeMojo for our data source. This was an excellent choice because it met our requirements for being a large data source that was updated every 4 hours. Because we started our data collection in the beginning of April, the data used in this report is listed as of April 7th, 2018. BoxOfficeMojo contained information on the gross sales, genre, studio, release dates, people associated with each movie, and much more. 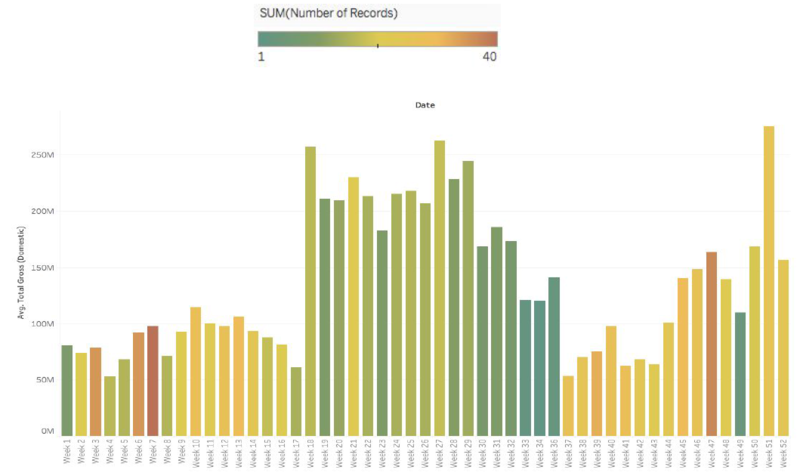 Using the Tableau software, we were able to discover some interesting trends. It is important to preface that the numbers used in our analysis represent gross sales and not profit for movies. BoxOfficeMojo did not include production costs in its datasets most likely for proprietary reasons. At its initial release, movies may have negative profits for some time until tickets sales begin to boost profits. Our objective was to find out which factors play a role in the success of a movie in terms of gross ticket sales earned. In order to reach this objective, we analyzed our data source and formulated 5 questions that movie makers should consider before making the decision to release a movie. We also wanted to take on this project from the consultant point of view for a quick glance of this industry. Question 1 : Is there any correlation between time of release of a movie and gross profit? What are the most profitable seasons? Questions 2: How has the overseas market changed overtime in the film industry? Question 3: How do the most popular movies in the US compare to the most popular movies overseas or worldwide? Question 4: Which movie genres typically generate high ticket sales? How heavily populated are these genres? Question 5: How does movie rating affect the selected studio? Q1: Is there any correlation between time of release of a movie and the gross profit? What are the most profitable seasons? When thinking about releasing a movie, the timing of release will obviously have an effect on the ticket sales. We set out to determine when the best time to release a movie should be, and also when the most profitable movie seasons are. To do this we extracted the gross domestic ticket sales and release dates of every movie from the BoxOfficeMojo.com database. 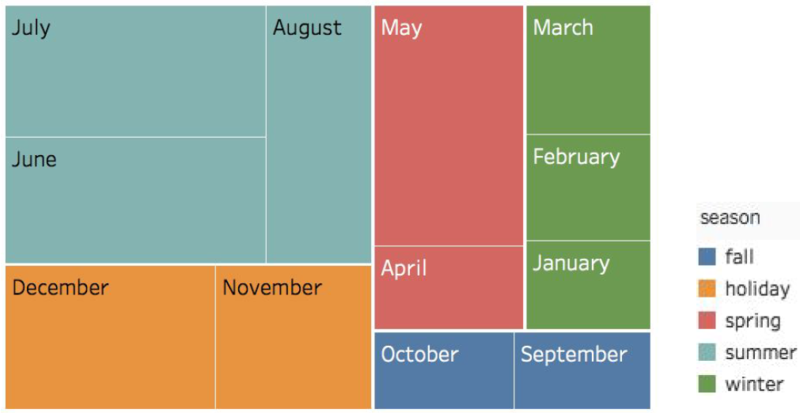 To better visualize the most profitable season we separated our data by the film industry seasons, which is a bit different than calendar seasons. The film industry has an added holiday season, and the months in each season is arbitrary. We conglomerated the average gross domestic sales from each month and then separated the months into their respective season as seen in Figure 1. Figure 1. A graphical representation of the average gross domestic ticket sales from each month, categorized by color into the film industry’s seasons. As shown by Figure 1, the most profitable season is the summer season, made up of June, July, and August. This is followed by the holiday season, made up of only November and December. Combined, these two seasons make up more than half of the average gross sales over the yearand only over a duration of 5 months. We then organized the data by week of release and plotted the 52 weeks of the year as the x-axis, and the average gross domestic ticket sales of all movies released on that given week on the y-axis, as seen in Figure 2. For added visual analysis we color coded the weeks based on the frequency of movies released in a given week, with green meaning a low frequency of movies and red meaning a large frequency of movies being released. Figure 2. A graphical representation of the average domestic gross ticket sales for a given week in the year. The color represents the frequency of movies in that given week going from green(not many movies released) → red(many movies released). Figure 2 shows interesting trends over the year. As shown with Figure 1, the summer and holiday seasons have the highest average gross ticket sales. However, there is a much higher frequency of movies in the holiday release season than there is in the summer season. This means that movies released in the summer have less competition than movies released in the holiday season. There are also a few interesting weeks that seem like local peaks with high frequencies of movies throughout the year. These weeks such as weeks 7, 27, 40, 47, and 51 correspond to holidays throughout the year. Specifically, they correspond to Valentine’s Day, July 4th weekend, Halloween, Thanksgiving, and Christmas, respectively. Of these holidays, Christmas seems to be the most profitable. There is also a jump from weeks 17-18, which is believed to be because week 18 is the official start of the Summer season. In conclusion, the timing of a movie release is certainly important. Overall, the most profitable season to release a movie is the summer season. Not only will the gross sales be higher on average, but there is also less competition on average in terms of movie releases on any given week. If the summer is unavailable, focusing on the holiday season or other holiday weekends can be profitable, but the added competition associated with specific holidays may hurt the overall ticket sales, and is something to keep in mind. Q2: How has the overseas market changed overtime in the film industry? As the world becomes more developed technologically, more people have gained access to digital entertainment. Specifically, worldwide ticket sales have been increasing rapidly since the the mid 1900’s as shown in Figure 3. Prior to 2000, domestic ticket sales in the United States dominated or matched that of overseas sales. However, after the year 2000, the overseas market has become increasingly dominant, nearly doubling the ticket sales of the domestic US market in 2017. With this in mind, directors should put more emphasis on appealing to the overseas market when making critical filming decisions. One example of this is the film Transformers Age of Ultron in which some scenes were specifically filmed in China to attract the Chinese audience. Figure 3. 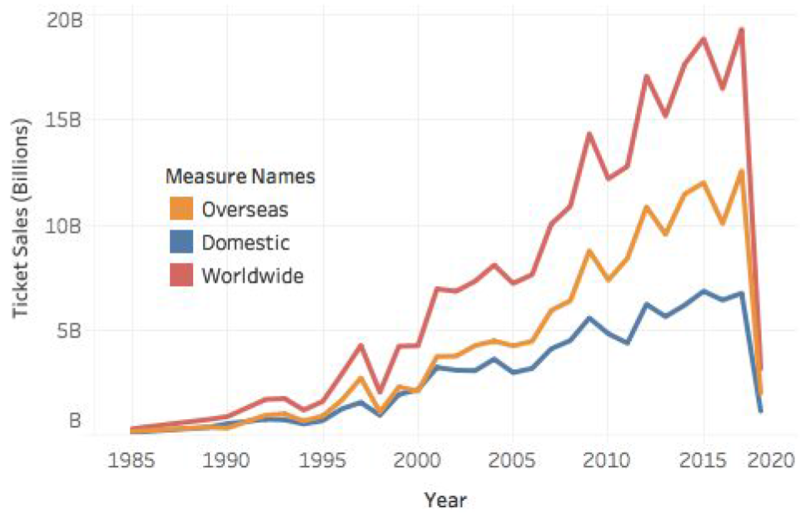 Plot of ticket sales trends over the years for the overseas, domestic and worldwide markets. Q3: How do the most popular movies in the US compare to the most popular movies overseas or worldwide? As the overseas market grows, it is interesting to look at the success of various movies in each market. 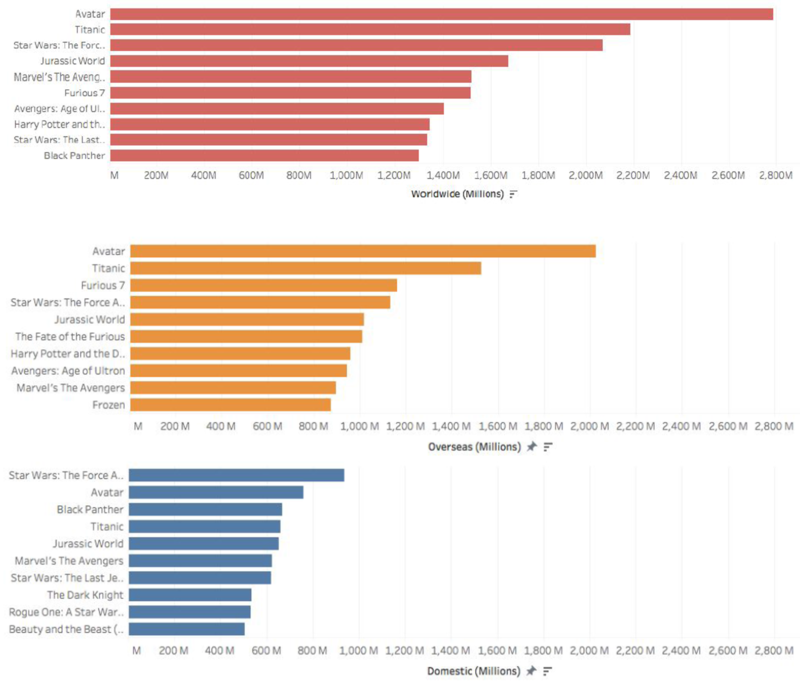 In order to do this, we decided to compare the Top 10 movies, in terms of ticket sales, domestically, internationally, and worldwide as shown in Figure 4. One interesting movie to point out is the recent domestic success of Black Panther in the United States, which has propelled it into the top 10 worldwide without huge success overseas. In this case, the United States market was the driving factor to the film’s profit. However, as seen in Figure 4 , there are plenty of movies for which their success overseas leads them to success worldwide. An example of this would be Harry Potter and the Deathly Hallows Pt.2 which appears in both the overseas and worldwide top 10, but is nowhere to be seen in the US domestic top 10. It is also interesting to note that movies such as American Sniper which are obviously geared towards the American audience were, intuitively, vastly more successful in the US domestic market. In combination with the previous question about the recent market shift toward overseas, it seems that it is no longer enough to simply cater to the United States domestic film market if global success is desired. Figure 4. Shows the top 10 movies, in terms of gross ticket sales, for the US domestic, overseas and worldwide markets. Q4: Which movie genres typically generate high ticket sales? How heavily populated are these genres? The dataset from BoxOfficeMojo, contains an extensive list of movie genres. In order to determine which genres typically generate high ticket sales, we first identified the top 20 movie genres in terms of average gross ticket sales. This resulted in the diagram shown below in Figure 5. 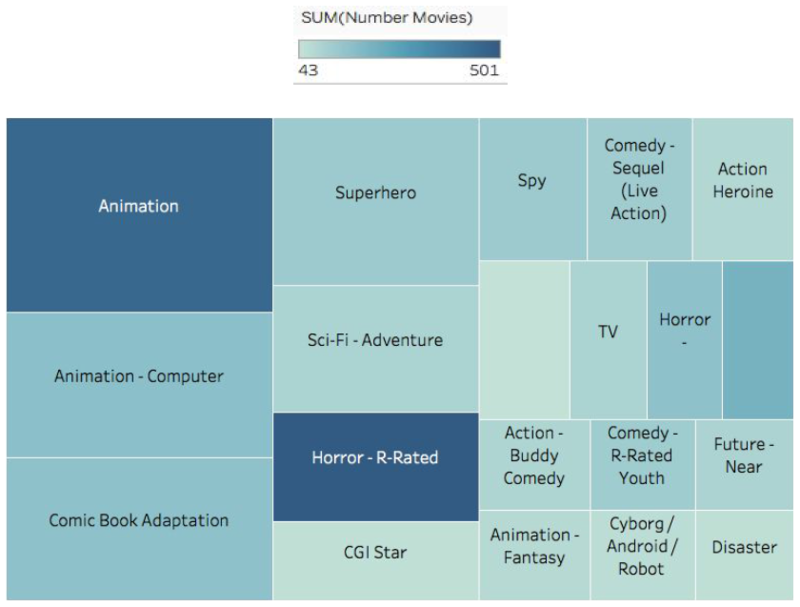 In order to determine how heavily populated these genres are, we utilized a shading scale in which darker shades of blue refer to more populated movie genres based on the number of movies categorized as that particular genre in the dataset. Figure 5. Top 20 Movie Genres in terms of Average Gross Ticket Sales. The shading refers to how heavily populated the movie genre is in terms of number of movies. Analysis of the figure above, provides valuable insight on which genres movie makers should focus on to increase their likelihood of generating high gross sales. Additionally, this figure shows that just because a movie genre has historically generated high gross sales does not mean that this is the best genre for producing a movie because genre density needs to be consider in addition to genre popularity. For example, R-Rated Horror films have historically generated high gross sales as shown above as it is one of the top 10 movies genres. However, this genre is heavily saturated with movies. This should raise concern for movie makers because there is only so much room for competition within each movie genre before they start taking away sales from one another. An example of this can be seen with the movie Interstellar . Even though Sci-Fi Adventure, of which Interstellar is categorized as, has one of the top 10 highest avg. ticket sales, the makers of Interstellar failed to consider the release date of The Martian , also a part of the Sci-Fi Adventure genre, as a possible impact on ticket sales since they are very similar movies. The Martian came out a month before Interstellar and was still in theatres at the time Interstellar was released. Although, Interstellar was projected to genre high ticket sales, it ended up only achieving about the same level of success as The Martian . This leads us to believe that had the release of Interstellar been at a time when The Martian was not in theatres, it could have seen additional success. It is important to note; however, that both movies did achieve relative success which coincides our hypothesis that Sci-Fi Adventure is one of the more appealing genres to viewers and therefore sees high average ticket sales. Q5. What studio is most profitable for each rating? Rating classifications are assigned to each movie by the Motion Picture Association of America. This is a standardized system that is used to label movies and filter out the audience in which it is best suited for. The four main categories that we used in our analysis are PG-13, PG, R, and G rating. We decided to exclude NC-17 because the content is usually very explicit and unsuitable for anyone under the age of 17. This rating isn’t played too often in theaters and didn’t have much significant data highlighted in our charts. In Figure 7 below, the y-axis is used to display the Average Lifetime Gross of movies within each rating class. 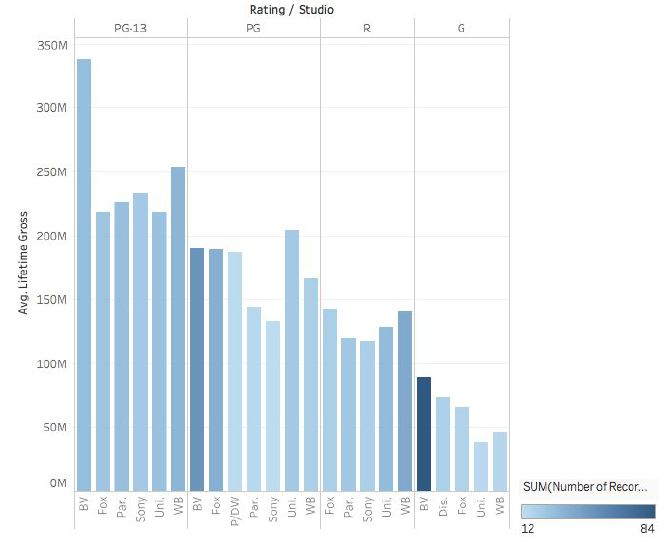 The x-axis show the top studios within each rating class. Together, our data shows that there is a gradual decline from PG-13 to G rated movie. This is consistent with common knowledge because PG-13 is the most general movie rating which caters to the largest audience and thus generates higher revenue.On the opposite end, G-rated movies typically cater to a smaller audience (children) hence, why the average gross sales are on the lower end. Figure 6. Average Lifetime Gross for each Studio in each Movie Rating. The shading shows the number of movies they have produced with that rating where darker colors indicate more movies. It is also important to note that the shading on this graph correlates to frequency. The darker the shade, the more frequently a specific studio releases movies of that respective rating. For example, if a movie maker wanted to create a children’s animation film, it is wiser for them to pursue Buena Vista or Disney as their studio of choice vs. the likes of Paramount or Warner Bros. This is simply due to the fact that those studios are not as experienced in releasing films of that nature (frequency) and/or don’t typical make as much in gross revenue in that rating category. Overall, ratings matter so it’s important to be cautious of the content in the movie because it ultimately affects the gross sales associated with the movie. The movie industry is a large revenue generating industry. However, the success of movies (in terms of gross sales) varies significantly throughout the industry. In order for a movie to be highly profitable, many factors need to be considered. This analysis provides insight to movie makers on factors to consider to increase the chance of generating high gross sales. The dashboard, shown below in Figure 7 , provides a summary of our analysis. Figure 7. Dashboard Snapshot. Shows overall summary of analysis. In the top left corner of the dashboard snapshot shown above, we have concluded that summer (June, July, & August) is a good time for movie releases because movies released in this time of year historically generate high average ticket sales, but yet the amount of movies released during this time is significantly less than during the holiday season so competition is less. Furthermore, from the graph at the top right corner of Figure 7 we can conclude that more emphasis should be placed on the overseas market due to the increase in total sales generated by the overseas market overtime. This is consistent with the general increase worldwide of westernization and urbanization. From the bottom left figure, regarding movie genre, we can see that it is important to consider the saturation of the movie genre in addition to the popularity of the genre in terms of ticket sales. Finally, from the bottom right graph, showing the average profitability of studios in terms of movie ratings, we have concluded that movie makers should be cautious of content during movie design and production because rating does affect sales with PG-13 rating generating the highest average gross sales. Additionally, when aiming to produce a movie for a given audience (rating), different studios should be considered based on their past success and experience. Overall, the success of a movie is dependent on many factors such as genre and release date. Movie makers need to consider all of these factors in order to increase their chances of creating a successful movie. This study proved surprisingly insightful on when and what type of movie to produce and release. I found it interesting how precisely the number of movies released lined up with certain holidays (for example, the huge spikes around Christmas and the difference between the week starting summer officially and the week prior to it). One aspect of theatrical releases I think would also be interesting to examine is the effect of major occurrences, like natural disasters or significant sociopolitical events, have on box office sales. For example, I know that the attacks on September 11, 2001, had impacts on several films that came out during that fall; many did not generate as much revenue as they could have (or at least were expected to) but they ended up being popular over time. Interesting analysis! It made sense to me which seasons had the most profits because the summer and holiday season are when families are together looking for activities to do. I has never thought about the overseas market when looking at movies so I appreciate you incorporating that into your analysis. I found it interesting that while some movies, such as avatar, were great hits everywhere, there is such a wide range of films of most popular movies. I find the analysis to be very interesting especially that the summer months have the highest profits. Contrary to the point above, I would expect summer to have the lowest profits because people are able to do many more outdoor activities. I find many people enjoy going to the movies in the months where the weather isn’t the best. I have a couple points I want to comment on specifically regarding the average gross domestic sales of movies in each month. First, did you measure the average sales of each movie in each respective month, or is it just the average sales in each month? Because if it’s the latter, a month with significantly more movies will, of course, have a greater average sales. My second point is I think you have to analyze if there’s a particular trend of studios releasing movies they expect to be popular in a specific month or range of months because that could greatly skew the data. I found this analysis very interesting – especially the yearly trend of profits. What I found most interesting was that during the summer months, less movies are released, but they bring in significantly more profits. During the holiday season it is the opposite, where many movies get released, but they dont make as much money. We can probably all recognize that during the holiday season many films get released, because they know families are together and will see a movie, regardless of the quality. During the summer, more quality films are released in order to have time to be recognized for awards. I think two additional factors that would be interesting to investigate are if there are certain combinations of actresses/actors that lead to significantly higher movie profits and if there are certain actors/actresses that when they play a certain type of role increase profits. The first question would be interesting to investigate because I know often times actors/actresses in the film industry develop better chemistry with some peers over others or may prefer working with certain individuals, and it would be interesting to see if these interactions are noticed by fans, resulting in increased sales. The second question would be interesting for investigation because of the different traits of actors/actresses. I assume some individuals are seen as effective at certain types of roles and ineffective as others. This may be useful for production companies when choosing their actors/actresses. Thank you for sharing your analysis. I thought that it was unusual that the most profitable seasons were during the summer months. There is some justification in the fact that some people are on summer vacation but I would have guessed that the holiday seasons where it is colder and there sometimes isn’t the option to be outdoors would be more busy. I would be curious to see if the genre had an affect on the country that they were most popular in. Having the information of which genres were the most popular could allow some producers to target a new market with less competition. 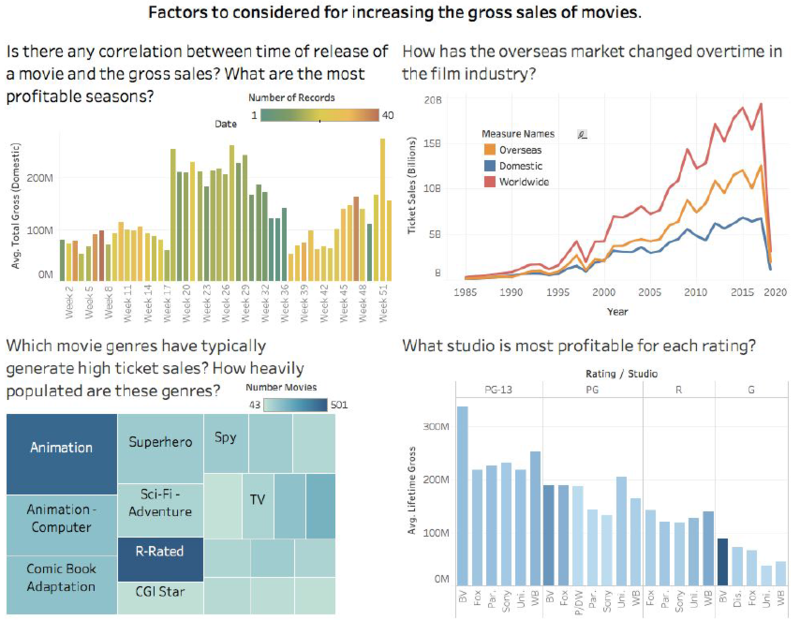 Figure 5 is a great tableau to use explain this specific question as it clearly shoes which genres are holding the highest tickets sales in the movie business. With more depth analysis on this topic there are a few questions I’d like to consider. One, how much more revenue does a movie with popular culture items associated with it (comics, video games, toys, etc.) make compared to its competitors? I think this would be an interesting thing to investigate, specifically in the Animation/Superhero categories) where there are more children or family oriented movies. It is surprising that the months of summer and spring have the highest sales contrary to what one would think that months of winter being the highest as that is the holiday season. I agree with the point made about the horror movies being saturated. Hence going by this logic it is always not good to repeat the history but to learn from it. I am shocked that the most profitable months are those of the summer. Since it is warmer outside I expected the colder months to be more popular for movies. I was trying to understand this and thought since kids were out of school maybe that is the reason movies are more profitable. I’d like to see the age groups buying movie tickets and how this correlates to type of movie, time of the year and so forth. I can’t think of another reason why summer would be more popular to go to the movies. Any thoughts?